Future Garden, a major art and science project by Newton Harrison and his late wife and lifelong collaborator Helen Mayer Harrison, is now on view at the UC Santa Cruz Arboretum and Botanic Garden through July 2021. UC Santa Cruz Arboretum and Botanic Garden is located on High Street between the main campus entrance and the west entrance. Detailed driving directions can be found here. Monday- Friday 12 - 5 p.m. Admission to Future Garden is included in a visit to the Arboretum and Botanic Garden. Admission is $5.00 ($2.00 for children, free to Friend's Members, volunteers, and UCSC students.) More information can be found here. 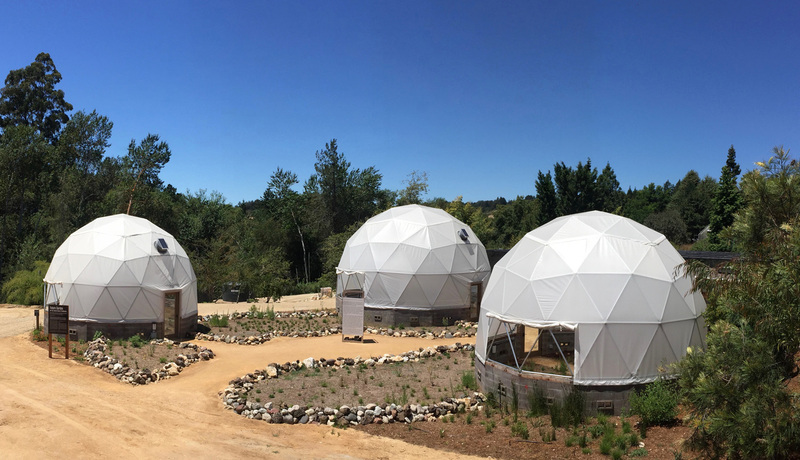 Internationally renowned eco-artists and UC Santa Cruz emeritus faculty, the Harrisons created a site-specific environmental art installation in the three geodesic domes and the surrounding garden at the Arboretum. Called Future Garden for the Central Coast of California, the installation, which Newton Harrison continues to evolve, transforms the newly refurbished domes at the Arboretum from relics of the past, steeped in 1970s era charm, into carriers of the future in response to the crisis of climate change. The Harrisons worked with scientists at UC Santa Cruz and botanists at the Arboretum, along with other artists, scientists, and visionaries, to create trial gardens within the domes in which native plant species are subjected to the temperatures and water conditions that scientists see for the region in the near future. The aim is to determine which plants are best able to thrive as the region warms and to propagate these species to create the scaffolding for more rapid regeneration of the local ecosystem as climates shift. As the Harrisons explained, the future for the rapidly warming planet lies in finding durable plant species that together create ecosystems that can continue to live and flourish as temperature increases. Future Garden is sponsored by the Andy Warhol Foundation, the Nion McEvoy Family Trust of the San Francisco Community Foundation, the Metabolic Studio, 30 Petals Fund, Rowland and Pat Rebele, and annual donors to the Institute of the Arts and Sciences.